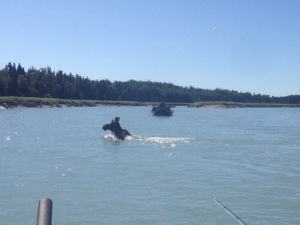 Kasilof river king salmon fishing the last two weeks of July can be very exciting. There is little time left to pursue these fish this season but if its on your list for a must do give us a call right away. We will try our best to make it happen. 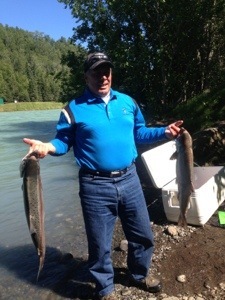 Yesterday’s bite was a bit slower but we managed to put a few in the cooler for the folks. They were not the biggest kings in the river but they offered a great take down and fight for the guys. We had this young bill moose cross right in front of us. I saw him coming and had the guys pull there lines or we would have had a moose on! !